This is what you get from mainstream media. Deap thought into the impact of christianity or any religious organization on mankind. This is what made this media outlet the entertainment giant it is today rather than a news source. Nifty thoughts from someone who thinks "Deep" is spelled "Deap". Religion is how people rationalize their actions. They can do whatever they want as long as they go to church on sunday and drop $20 in the till. Born agains attacking clinics, ayatollas torturing people, mujahadeen trafficing drugs.. and Al Sharpton. this is why i'm not christian, theres no frontal lobe activity that says hey this is wrong because it's unfair, the only brain activity in this article is making excuses for BREAKING THE LAW. "All a man's ways seem right to him but the lord weighs the heart'. Paul said to respect government, the world will always hate christians who say one thing and do another. Wayne I LOVE YOUR COMMENT, religion is totally rationalizing what you want to do, blow up a building, break the law for money, start a cult or marry multiple wives. FYI, counting cards is not illegal. Binions was the last single deck (shoe) casino and hasn't used a single deck shoe in years. You can't count cards on a multi-deck shoe. I smell BS aimed at trying to lure church people in now that Vegas is a waste land and going bankrupt. Actually you can. As long as the casino is using any number of complete decks card counting works. In fact it gets more stable the more decks are used. Yes you can, and its pretty easy, You can learn on youtube or read the book "beat the dealer by Edward o. thorpe. I can do it and im no math wizard. Perhaps you should study a bit before you opine on things you have little real knowledge about. Our team is only allowed to play shoes and beats them silly much of the time. (And our getting thrown out of casinos pretty constantly for playing six deck shoes pretty much says that they can be counted). Simply proves there is *nothing* a believer will not do and still call himself a moral and religious person. So how do you explain away the source of all that casino money? You just pretend you have no idea how many desperate people throw cash at the glorious altar of Saint Luck? Would you buy an iPhone from a company that exploits underpaid workers in hazardous conditions? Those workers could've chosen a different job, so they obviously deserve to be exploited! Nothing immoral about that, right? It's another bogus mass produced article Vegas regularly sends out to drum up interest in traveling there. Don't believe it. Casinos use multiple deck shoes and NEVER use all the cards before reshuffling as any black jack player already knows. A complete hoax. It's a game. Have fun, and don't forget to store the treasure in heaven! It's not gambling – it's mining money. The Biblical issue with betting is not the gamble, it is where the money comes from. Your big win and great life, comes from somebodies else's catastrophic loss and screwed life. Gambling is a big "up yours" to your neighbor, hardly the golden rule. it's a game of chance. no one is forced to participate. I agree. How many people have looked at David Drury and been excited by his "winnings"? Then responded by making ignorant bets, placing their faith in luck (instead of God) because they think Drury won through luck (when really, he won by cheating)? Casinos make money by exploiting people who are either desperate or greedy. While the desire to win a full week's wage for only 10 hours of "work" might be considered greedy, the big problem is who LOST that money. Casinos don't mind if a few people win, because it stimulates the greed and recklessness of others. Even if the casino lost on Drury as an individual, every casino corporation comes out ahead, every night. And if Drury caused a casino to NOT come out ahead, they just adjust the odds slightly to compensate for whatever was lost. If Drury doesn't feel bad about cheating, do you think a corporation would feel bad about stacking the deck? It's difficult to judge. Certainly a lot of people gamble for entertainment knowing that they will likely lose some money. But then there are addicts that suffer from gambling. It's a lot like drinking ... some drink in celebration and joy, while others are are destroyed by it. It's good for some and bad for some. It's not possible to generalize. I don't have any problem with this, but such a lifestyle can hardly be considered a "calling," or making any kind of positive contribution to the world. It is purely self-concerned (like almost everyone's lives). While I don't see anything particularly wrong, neither is there anything exceptional or praiseworthy here. Looks like he finally lost, everything including his soul. and you are qualified to determine this how? nowhere does he explain why Jesus would be OK with it. WHo cares he made millions. "Jesus" of the Bible cannot have an opinion. He never existed then, and he certainty does not exist now. So stop using imaginary Jewish people to make you feel better about your issues. BUT DUDE HE PROMISES YOU MAGIC UNPROVEN AFTERLIFE IF YOU TELL HIM HE IS YOUR JEWISH ZOMBIE MASTER BRO! and of course the holocaust was not real and Jews run the entire world. Got a few myths of your own, huh? What does not beleiving in a story book charector have to do with believing in the holocaust? Usually the jeebus types don't seem to be interested in statistics of facts. I thought they bet by going with the "lucky" machine or the table that's "on a roll". 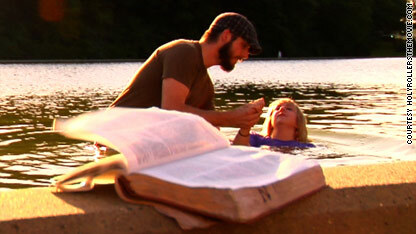 I bet these so called jesus freaks play the lottery but that is ok because it is diferent some how. Religion has always been about rationalizing whatever you really want to do. And anti-religious bemoaning has always been about promoting one vice and smearing it over everything else that is good. @Al that goes double for religion. Please read up on the crusades, Salem witch trials, Lord's Resistance Movement (lol@ those who didn't know what it was before the stupid kony video), and manifest destiny. What atrocious, murderous things have American Atheists done? @Al oh that's right you see anyone who believes anything that contradicts your fairy tales as a direct personal attack. You over exaggerate it to get people on your side while babbling in foreign tongues and rolling on the floor screaming HELP ME JESUS! @Michael As I said, thousands of years of existence, billions of believers, unendless acts of kindness and goodness, and you come up with how many examples? Judging from your tone, like you're the one taking the attacks personally. @Michael I'd like to rip the heart outs of certain Popes and Kony myself, dont care if that sounds not loving. But another tragedy is letting these animals be used to smear the many good that others have done in the name of love and forgiveness. 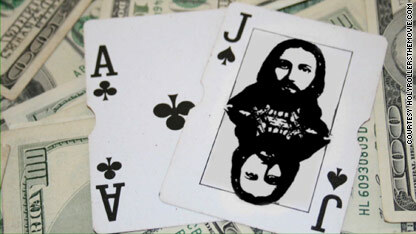 How can Jesus support card counting? He's about giving not gambling.